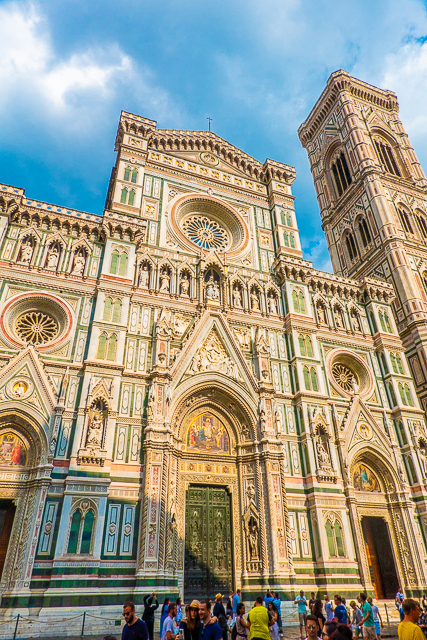 Our Italian adventure continues with a day trip to Florence. I was SO excited for our trip to Florence. 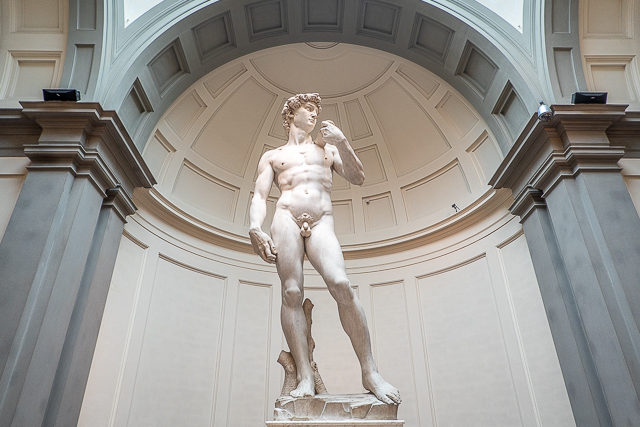 I have always wanted to see Michelangelo's David in person. I can tell you that it lived up to my expectations! It was definitely worth the trip. 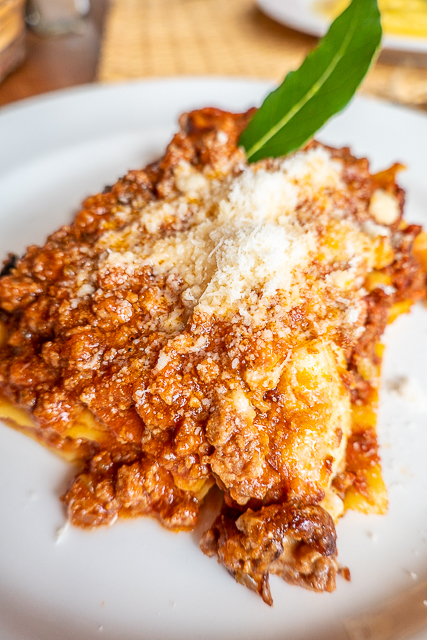 We also took a walking tour of the city and had the BEST lasagna on the planet!! It was a long day. We packed a ton of stuff into a few hours in the city. The night ended with an amazing Steak Florentine. Keep reading below to see everything! 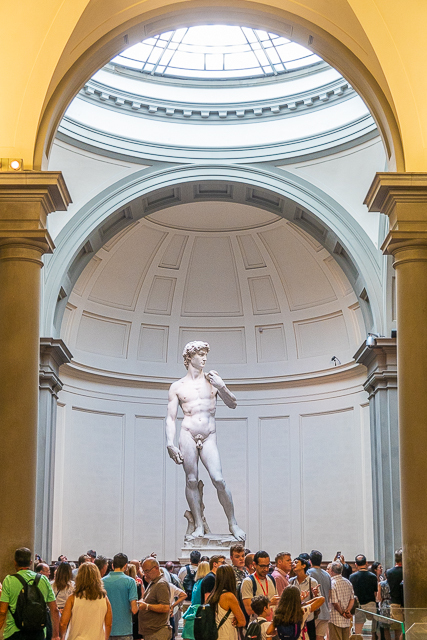 We arrived in Florence and headed straight to the Galleria dell'Accademia. 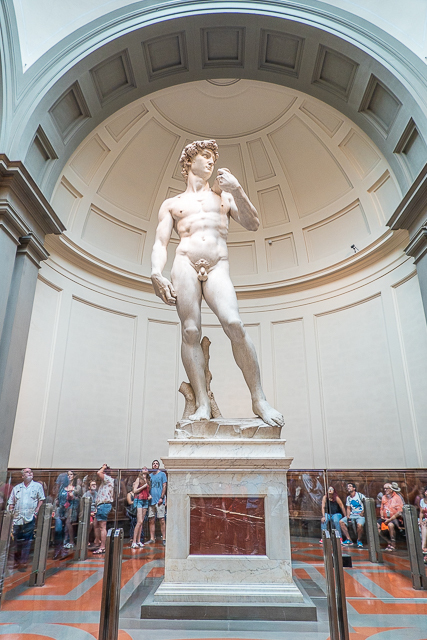 We had skip the line tickets, so we walked and went straight up to David. 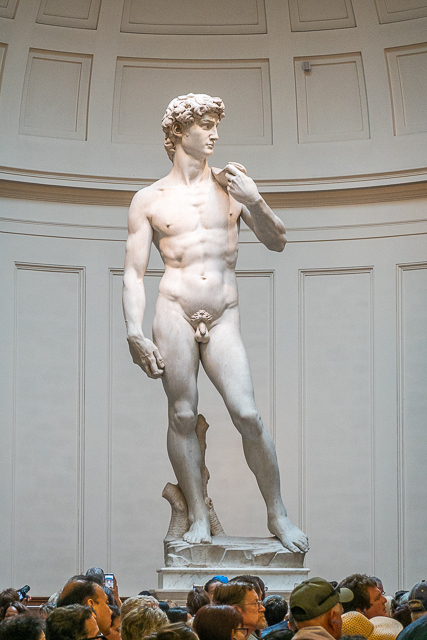 David was sculpted by Michelangelo between 1501 and 1504. He stands 17 feet tall! It is a very impressive work of art. 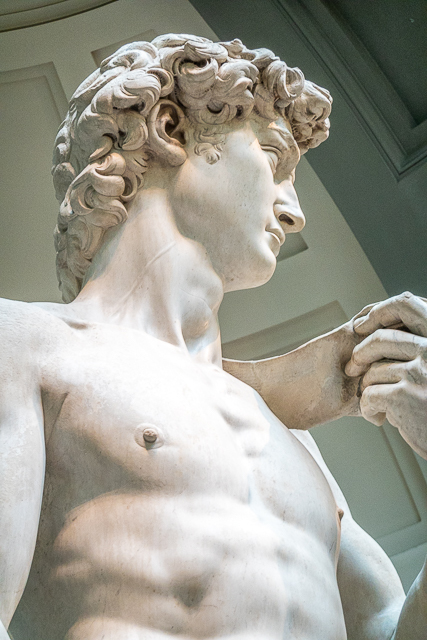 I was amazed at how different David looks from all the different angles. 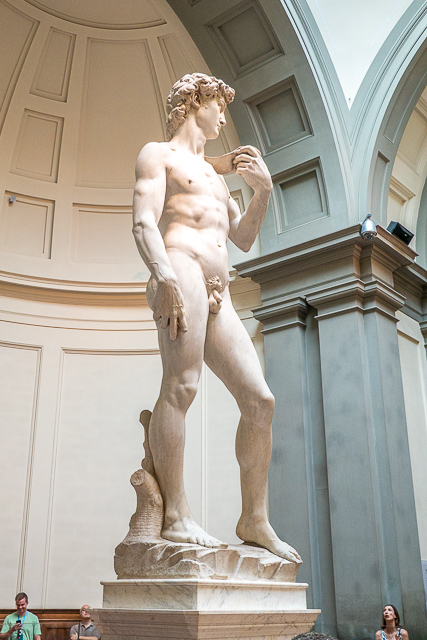 The statue shows David after he has made the decision to fight Goliath but before the battle has actually taken place. His left hand holds a sling that is draped over his shoulder and down to his right hand, which holds a rock. 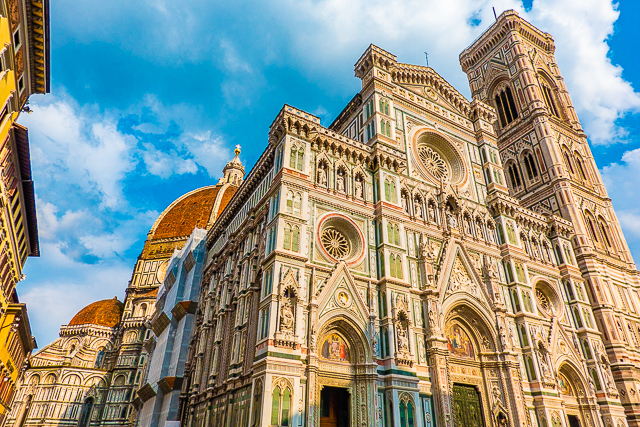 After visiting David, we headed out on a little walking tour of Florence. 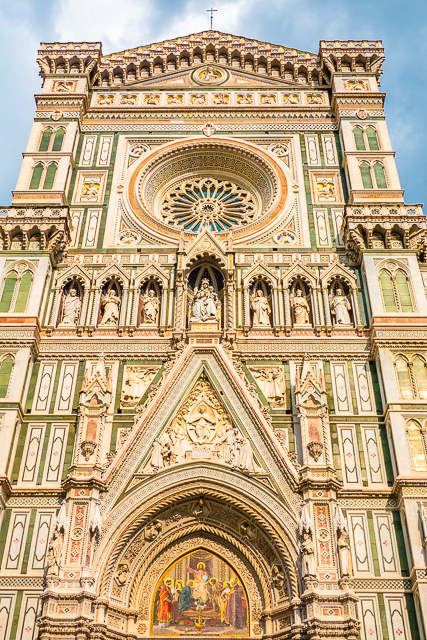 We stopped for pictures at the Florence Cathedral. The church was started in 1296. It was completed in 1436. We didn't have time to take the tour on our trip. I have it on the list for next time! The Dome is 376 feet tall. You can take a tour and climb up inside the dome for great views of the city. You can BOOK the tour here. 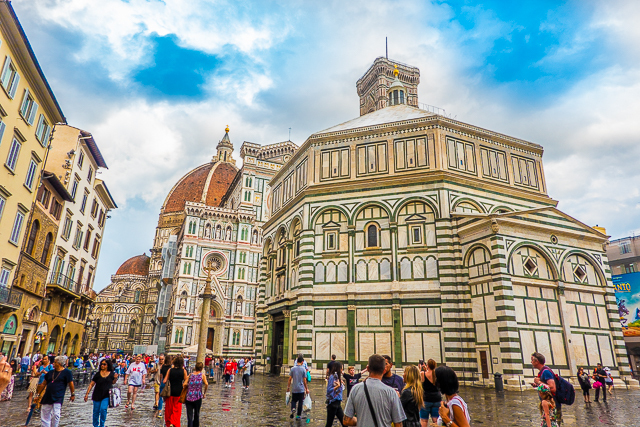 This is the Baptistery of St. John. As you can see, it is located next to the cathedral. Next up on our walking tour was the Palazzo Vecchio. 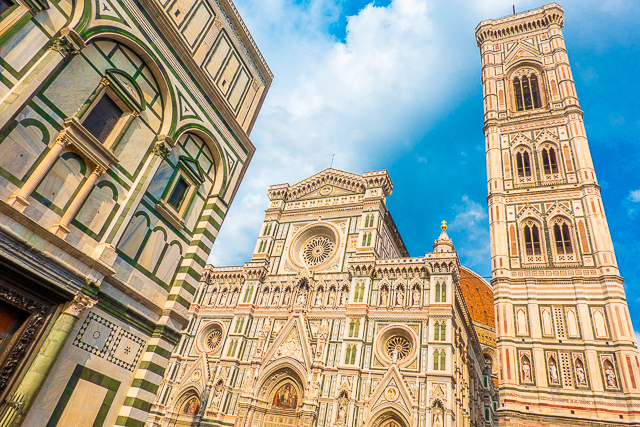 It is the town hall of Florence. 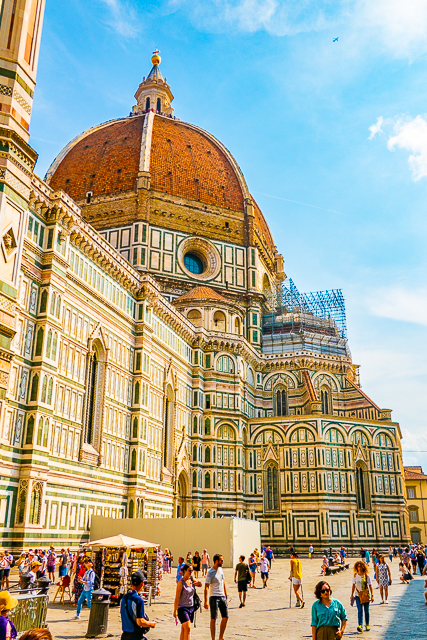 It overlooks the Piazza della Signoria. 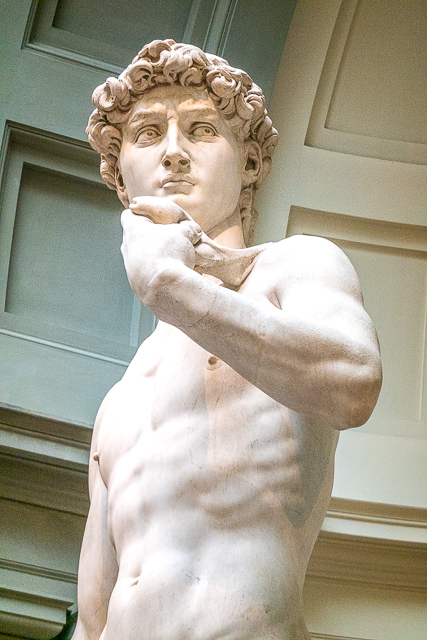 There is a copy of Michelangelo's David statue in front of Palazzo Vecchio. Several tourists were taking photos of the statue thinking it was the real thing. 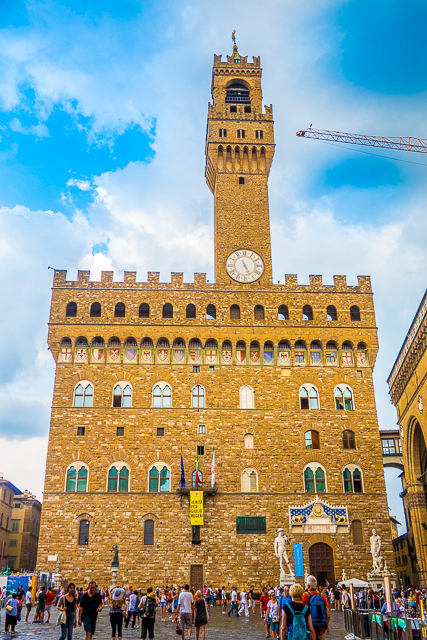 You can tour the Palazzo Vecchio and see all the secret rooms and art. 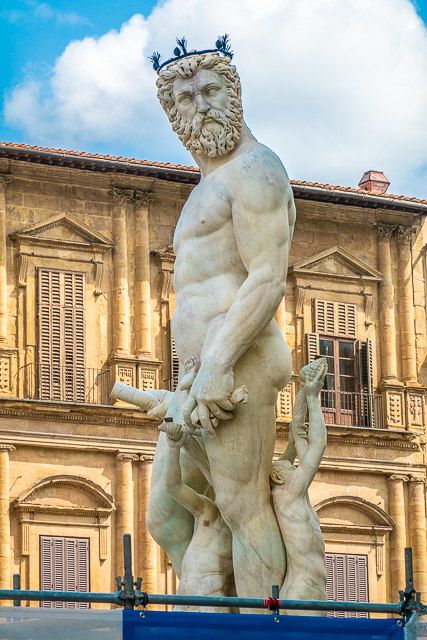 The fountain of Neptune is situated on the Piazza della Signoria, in front of the Palazzo Vecchio. It has been under restoration since 2016. They recently unveiled Neptune. The rest of the fountain is covered with scaffolding. 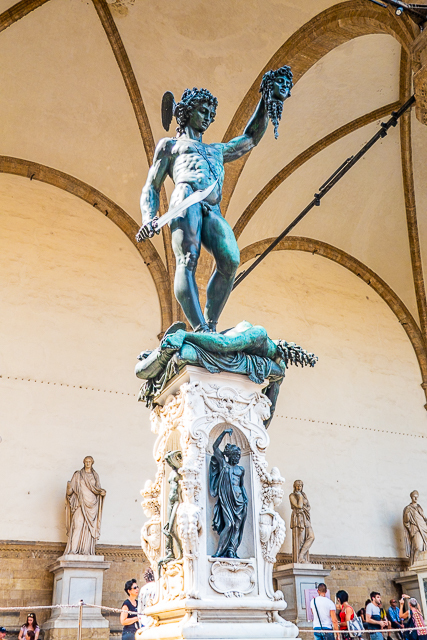 The gallery of statues is next to Palazzo Vecchio in Loggia dei Lanzi. 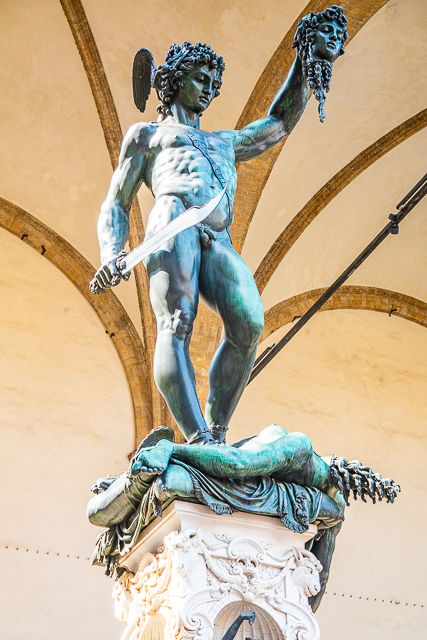 The most famous statue in the gallery is Benvenuto Cellini's Perseus with the Head of Medusa. It is made out of bronze. 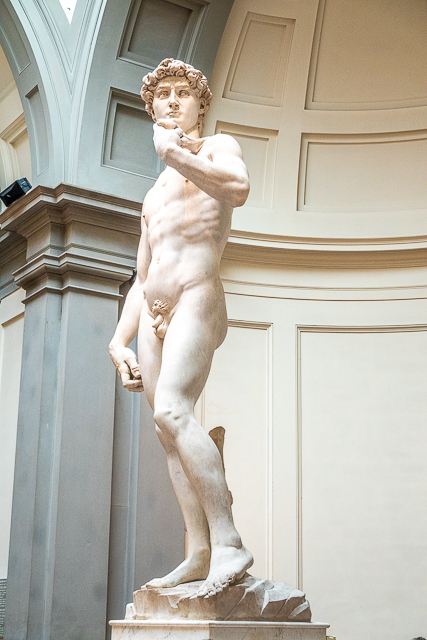 It was sculpted between 1545 and 1554. It shows the mythical Greek hero holding his sword in his right hand and holding up the Medusa's severed head in his left. 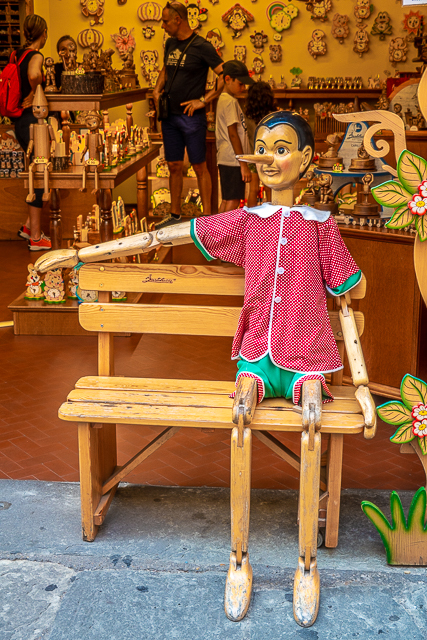 I noticed tons of Pinocchio references in Italy. 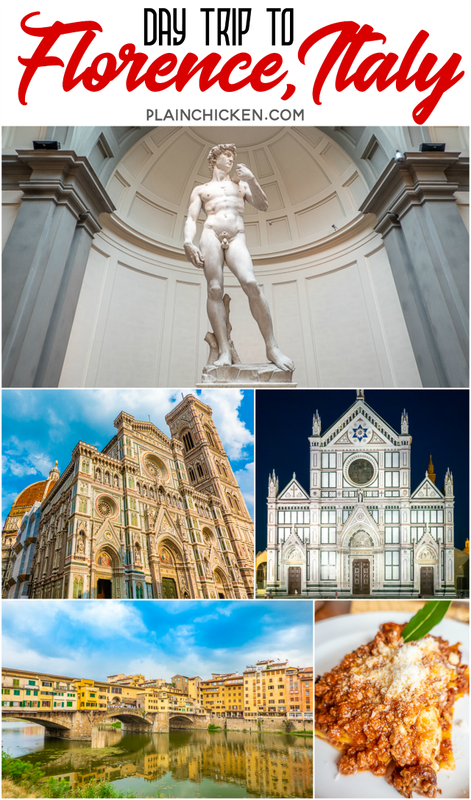 I learned that Pinocchio was born in Florence! Le Avventure di Pinocchio was published between 1881 and 1883 by Carlo Lorenzini, a Florentine by birth. 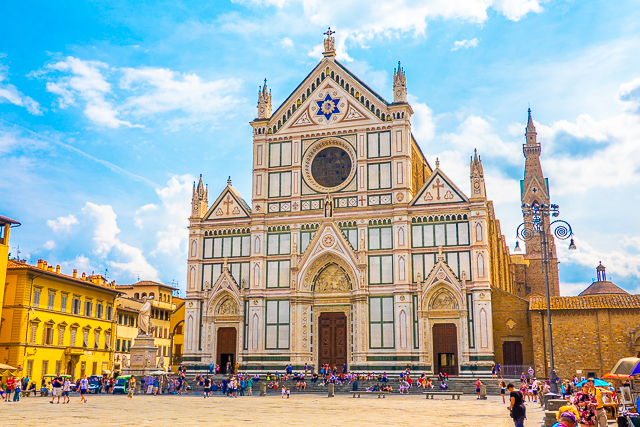 The Basilica di Santa Croce is where Michelangelo and Galileo are buried. It is a Roman Catholic Church. 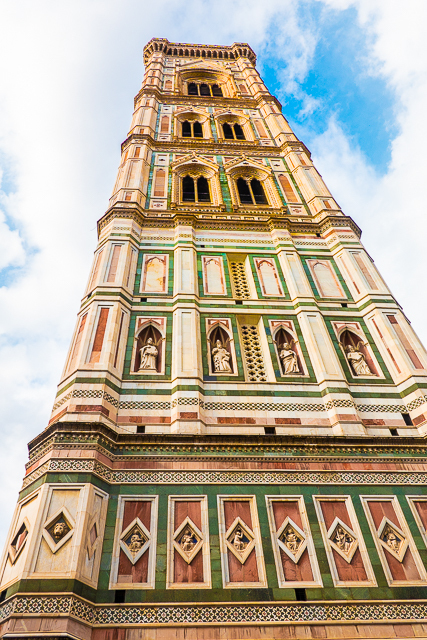 It was started in 1294 and completed in 1385. You may notice the Star of David at the top of the church. The architect that designed the church's facade was Jewish. 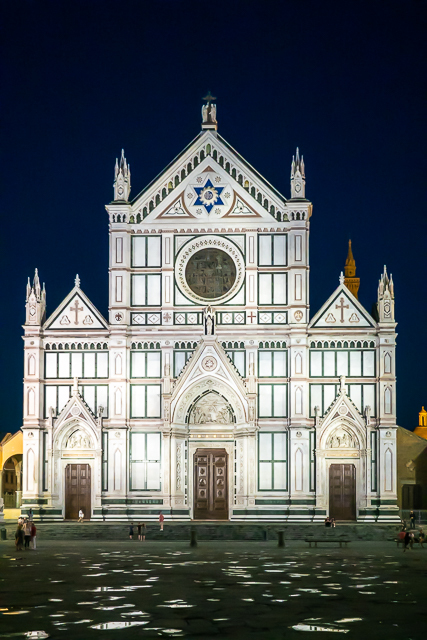 It is said that he placed the Star of David at the pinnacle of the tympanum of Santa Croce in recognition of his religion. This hasn't been confirmed, but that is what they say. The antique carousel is owned by the Picci family. It is made out of wood and consists of 20 horses and two gold king carriages. 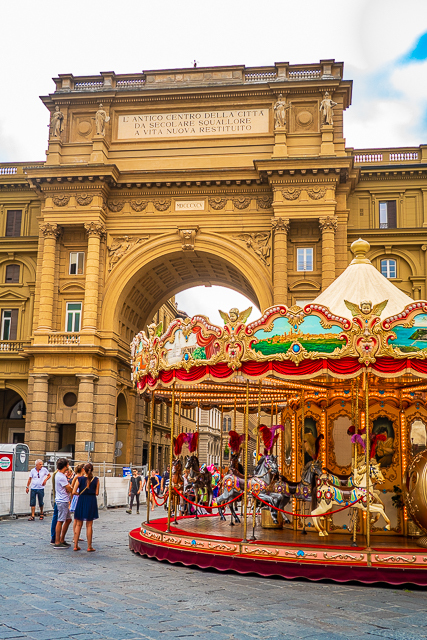 It is run by Carlo Picci, who is the fourth generation of the family to run the carousel. 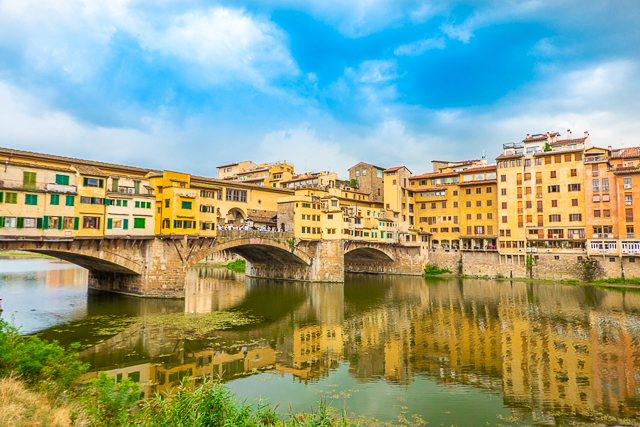 Ponte Vecchio is the oldest bridge in Florence. 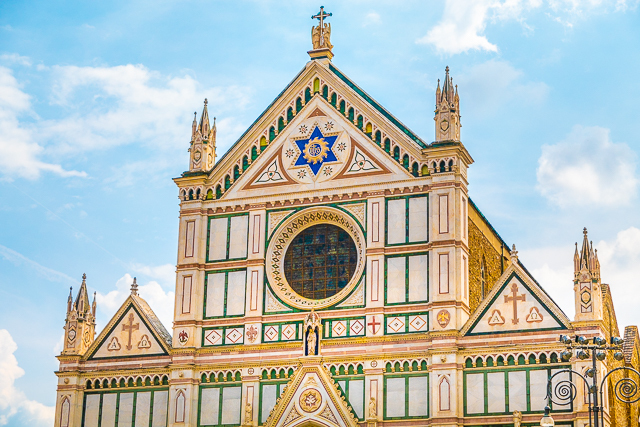 It was designed by Taddeo Gaddi. It goes across the Arno River. Today it is filled with high-end shopping. Porcellino is a famous bronze fountain in Florence. 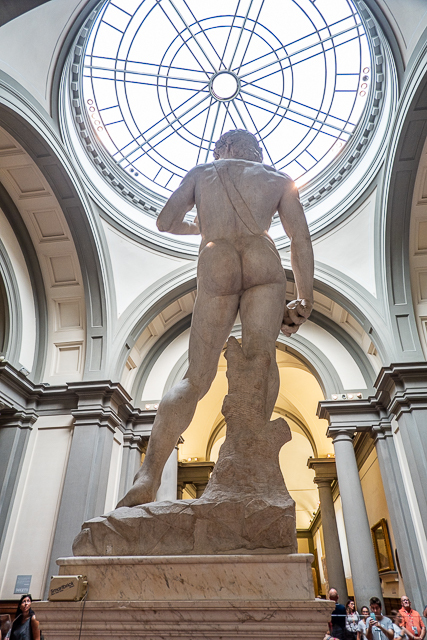 The original fountain figure was sculpted and cast by Baroque master Pietro Tacca shortly before 1634. The current statue is a replica that was made in 2008. 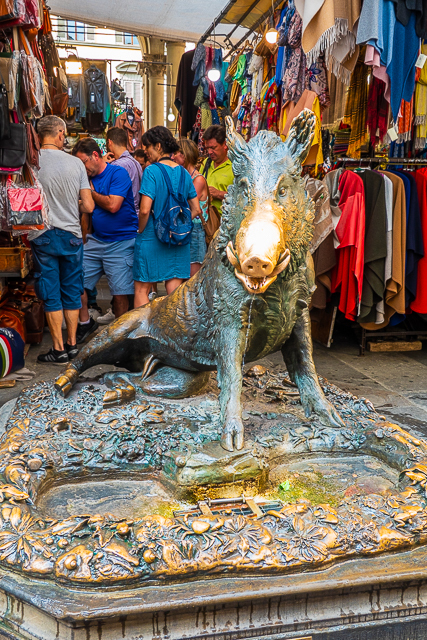 Visitors to the fountain put a coin into the boar's mouth, with the intent to let it fall through the underlying grating for good luck, and they rub the boar's snout to ensure a return to Florence. 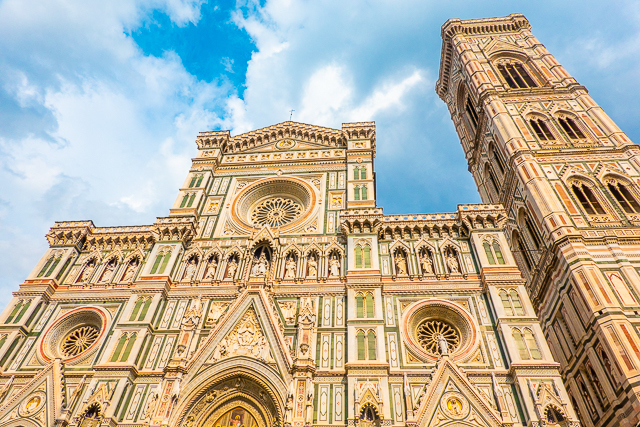 Florence is known for its gold. I couldn't resist buying a rose and white gold bracelet from this guy. He works at The Gold Market in Piazza di Santa Croce - the square with the Basilica di Santa Croce. Chicken Legs is a wrist watch guy. 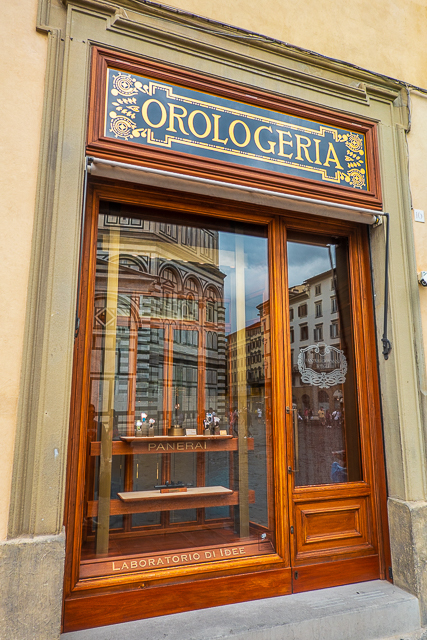 We had to go visit the original Panerai boutique in Florence. It is located next to the Cathedral. 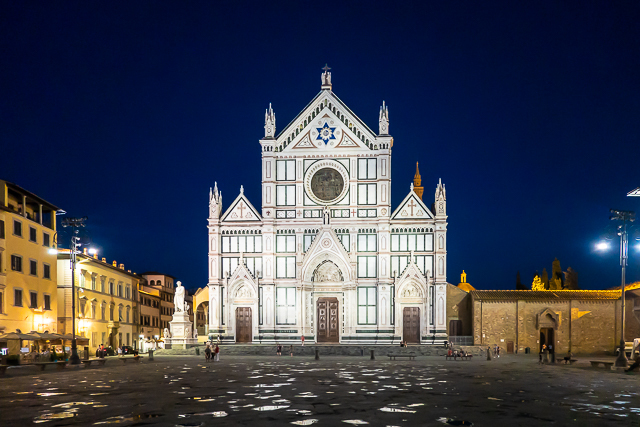 After dinner, we met back in Piazza di Santa Croce to head back to Tuscany. 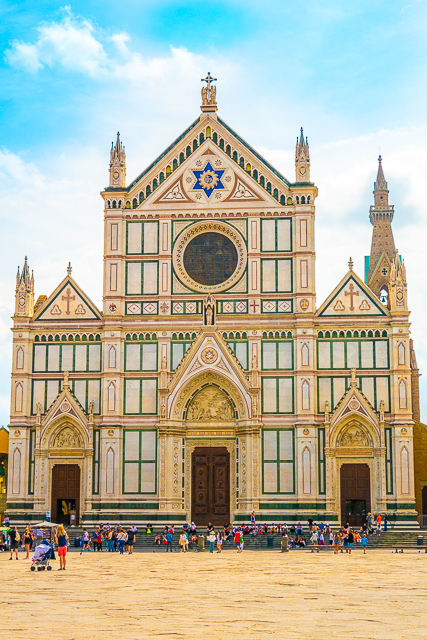 I couldn't resist taking some more photos of the Basilica di Santa Croce. 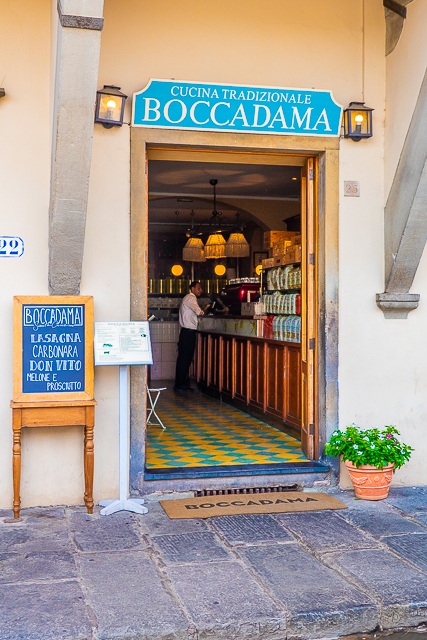 We had an AMAZING lunch here at Boccadama in Piazza di Santa Croce. 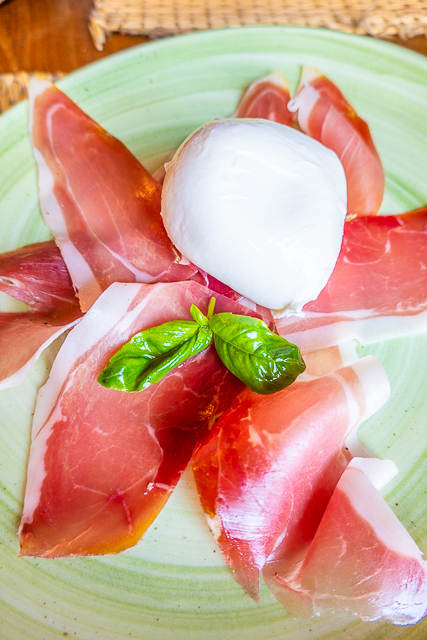 Next prosciutto and fresh mozzarella. Fantastic. Next up was THE BEST lasagna on the planet. Seriously delicious. I wish we each gotten our own piece! 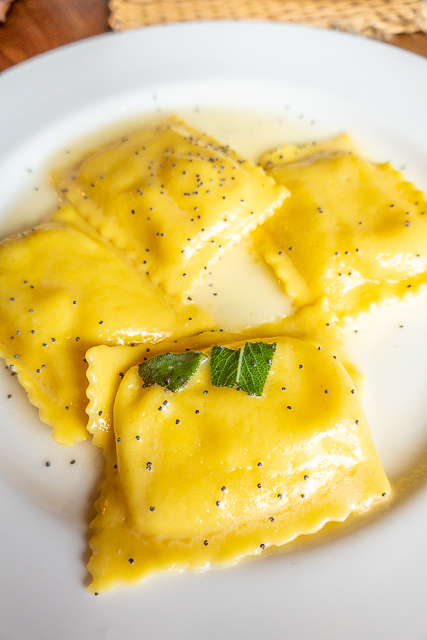 In addition to the lasagna, we also shared the pear and gorgonzola ravioli in sage butter sauce. Since we were on vacation, we HAD to get dessert. 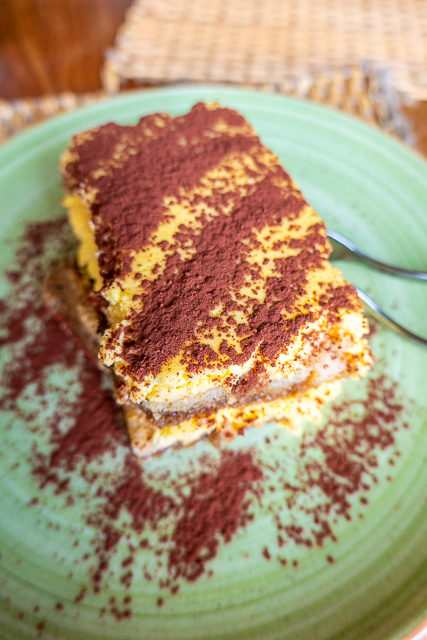 The tiramisu was one of the best we ate in Italy. 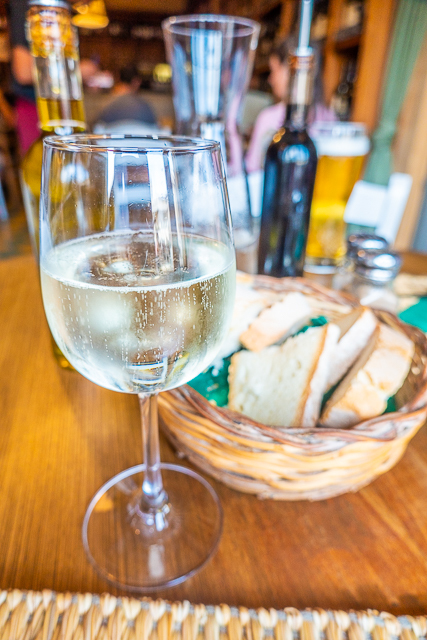 We ate at Giannino in San Lorenzo for dinner. 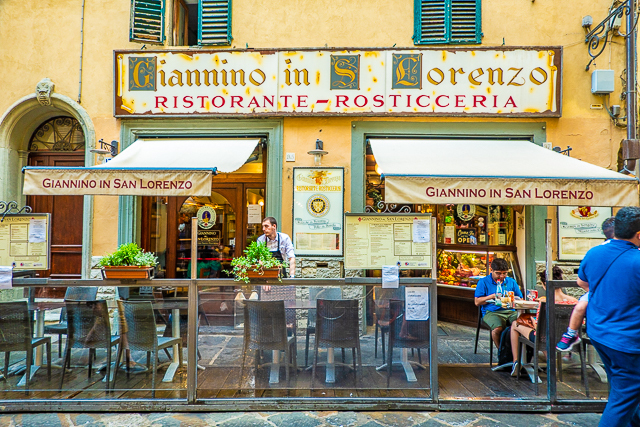 They are known for their Steak Florentine. Chicken Legs and I split this monster! It was really good. 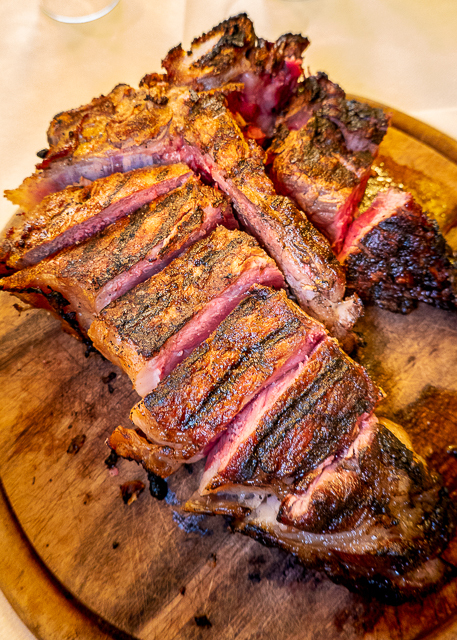 Basically a fresh cut T-Bone steak. 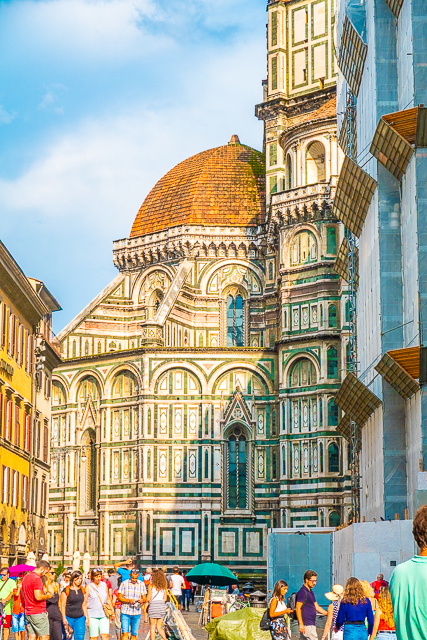 We packed a TON of stuff into a few hours in Florence. I would love to go back when we had more time to tour the churches and go up in the dome. Our Italian adventure continues next week with our favorite city - Venice! These pics are so travel goals! And jealous of all the amazing food you're eating! I had no idea David was so tall -- I envisioned it just like regular person size. Very cool! Hope you have an amazing rest of your trip! I am taking my daughter to Italy next summer for her 40th birthday. I have been before, but we'll be visiting some places I've never been, like the Amalfi coast. I would love to pick your brain about so many things, but would rather not take up your blog. Would it be alright for me to email you with some questions? You can email me any questions. I will do my best to help you! I just wanted first to tell you thank you for amazing plain chicken. Your articles take me back to the good old days when my grandmother & Mother would be in the kitchen cooking some amazing food for us and all I remember my Mom & grandmother use to say we made it with alot of love . CAN I HEAR A AMEN. STEPHANIE, I HAVE A QUESTION ? have you ever heard of oyster dressing? Here is the problem my Dad's parents was Cajun, french, & not let's us forget Irish & yes we are a whole lot of mess. Any way out of all my Dad's 14 sister not 1 had a complete recipe for this .